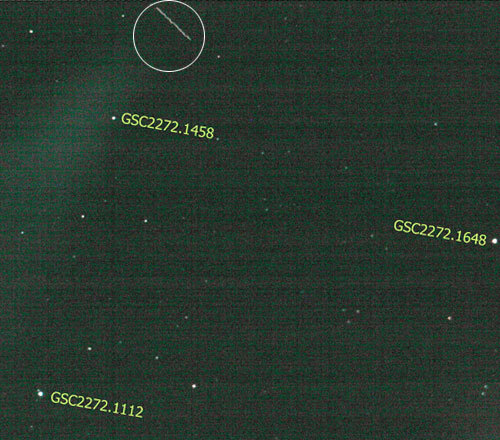 Keen sky watchers in Japan caught a quick glimpse of the Mars Reconnaissance Orbiter as it sped through the sky on its path to the red planet. 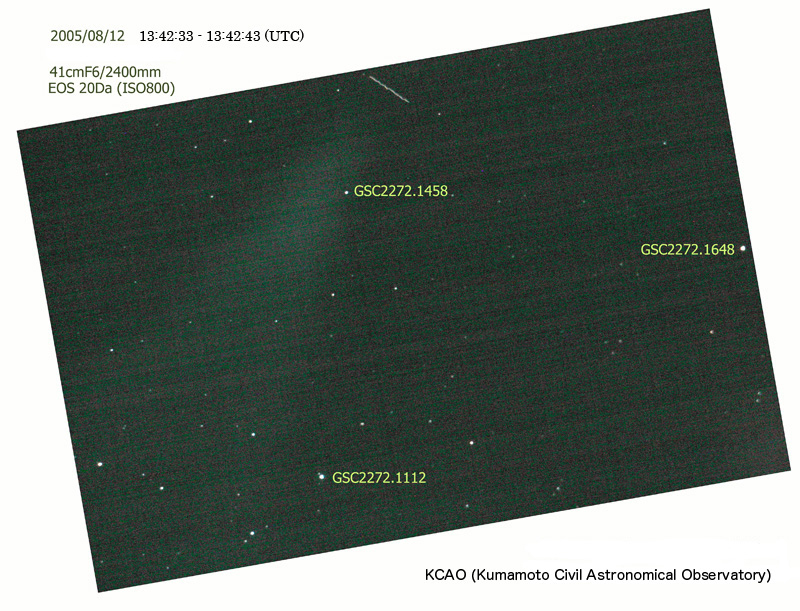 On Friday, August 12, 2005 sky watchers at the Kumamoto Civil Astronomical Observatory in Japan thought they might be seeing a comet or other unidentified object. The sighting turned out to be the Mars Reconnaissance Orbiter streaking through the Pegasus constellation in the night sky. The streak appears at the top of this image in the center. The image, taken through the Observatory's 41-centimeter (16-inch) telescope, along with observations through binoculars and confirmation of the spacecraft's trajectory, confirmed that the mysterious streak was, indeed, NASA's latest mission to Mars. When viewed closely, the shape of the object indicated that it was the spacecraft aboard its Atlas V rocket and its contrail. It is estimated that the spacecraft had quite an audience in Asia as it raced across the sky. Eyes were on the skies because August 12 was the optimal night to view the Perseid meteor shower.